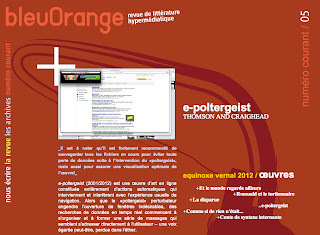 Revue Bleuorange based in Montreal asked us to rework our 2001 webwork e-poltergeist for Issue 05 of their online journal available right here. e-poltergeist (2001/2012) is an online art work made entirely out of automated actions that intervene and interfere with normal browsing activity. As the disruptive 'poltergeist' spawns unwanted windows onto the user's desktop, live search data begins to form into a series of messages that appear to be directly addressing the computer user -a lost voice perhaps, caught in the ether. This version of e-poltergeist is a reworking of the original piece first commissioned for the exhibition 010101: Art in Technological Times held at San Francisco Museum of Modern Art (SFMOMA) in 2001. It has also been translated into French especially for the fifth issue of bleuOrange.